In 1878 two Mormon families arrived from Utah to settle along Silver Creek in a place which would become Taylor Arizona. Taylor, named for John Taylor the third president of the Church of Jesus Christ of the Latter Day Saints (Mormon Church), has several historic sites which serve as examples of daily pioneer life in the area. The sites provide insight into the changes which occurred as the citizens of Taylor adjusted to world, national and community development. Don’t miss the Veteran’s Memorial and Mural of Historic Taylor sites, adjacent to the museum. The veteran’s monument, built to honor Taylor’s brave men and women who served in the military, features Taylor veterans’ names from World War I to the present. A mural of Taylor historic sites overlooks the monument from the south wall of the Taylor Museum. The Margaret McCleve Hancock log cabin is located at the intersection of East Willow Street and Main Street. Born in 1838 in Belfast, Ireland, Margaret McCleve made the thirteen hundred mile journey from Illinois to Utah with the 1856 Mormon Handcart Company. She married Mosiah L. Hancock and in 1879 they left Utah to help settle Taylor at the request of Brigham Young. Upon her arrival, she was “set apart to minister to the needs of the sick and to midwife.” Mosiah and Margaret M. Hancock raised thirteen children in this small cabin. In 1914/1915, the cabin served as a schoolhouse for the first and second grades. In the grove behind the cabin stands a small fort built with logs from Ft. Wingate, New Mexico. The Standifird Home on Main Street in Taylor exhibits many family heirlooms donated by Standifird descendants. John Henry Standifird and his children were co-founders of Taylor in 1878. In 1905, Aquilla Standifird, son of John, purchased the distinctive 1890 stone house built by the Brimhall family. In 2004, Aquilla’s son, Jack, donated the Standifird Home to the Taylor Heritage Foundation. The Jane Hatch Camp at 400 East Street was built for meetings held by the local branch of Daughters of Utah (DUP) Pioneers and to preserve treasured artifacts from pioneer times. It was dedicated by DUP President Kate B. Carter as “The Jane Hatch Camp.” During the 1950s, the timeworn house fell under the wing of the “20-30 Club,” a Taylor social group. In November of 1987, the Latter Day Saints (LDS) Church deeded the building to the 20-30 Club. 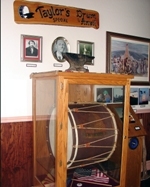 Ten years later, the club collaborated with the Taylor/Shumway Heritage Foundation to create the Pioneer Museum. The 1900 Shumway Schoolhouse on the Shumway Road, was created from locally fired soft red brick. This school was totally restored in the 1990s and has been recognized as a living legacy. Today, visitors can see the names of yesteryear’s schoolchildren etched into the soft bricks, vintage furnishings and treasured photographs.